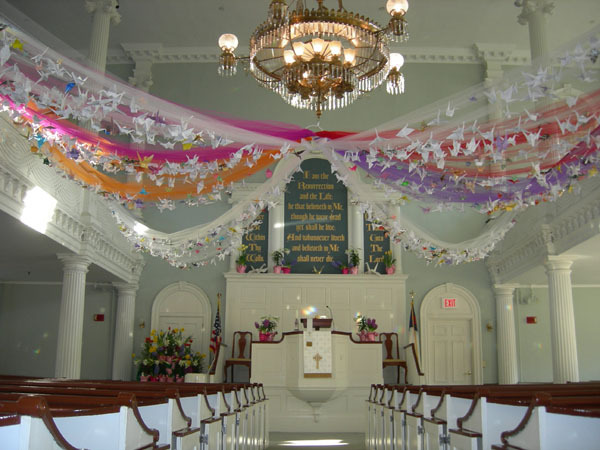 Easter Sunday, 2009: The RHCC sanctuary is filled with over 1000 paper cranes, made during the days of Lent by members and friends of the church. A universal symbol of peace, the cranes invite our commitment to sharing the peace and love of Christ made known at Easter with our community and our world. The cranes will remain in the sanctuary until Pentecost Sunday, May 31. To jump to a specific photo, click on its thumbnail image on the left.